KayKiSpeaks.com: Male R&B Group You've Been Missing Is Here: MPrynt Touring with Marsha Ambrosius! 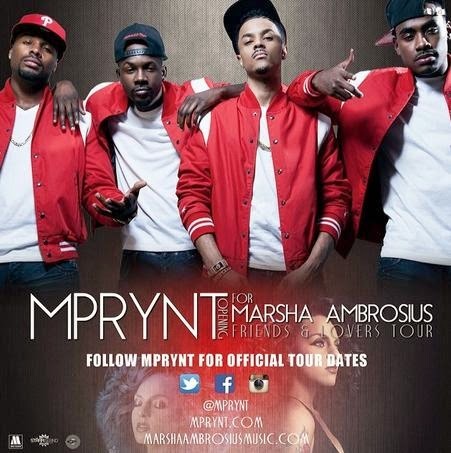 Male R&B Group You've Been Missing Is Here: MPrynt Touring with Marsha Ambrosius! I've had so many great conversations recently about how badly a vocally solid, mature, male r&b group is missing in today's music! Just yesterday I entertained a conversation on my timeline reliving that all too perfect Boyz II Men sound. That sound affectionately referred to as Motown Philly combined smooth complex harmonies and a soulful blend that will forever be cherished. Boyz II Men may not have known it, but they were paving the way for another group of youngsters coming out of Philly. Now years later another Philly born group of talented young men is ready to take center stage. MPrynt is a 4 piece full vocal orchestra with Budda, Rael, Tyce, & Faheem at the mic.The four vocalists combine that sweet Motown Philly sound with the familiar approach of modern day R&B for something incredibly delightful to the ear. These guys not only sing their behinds off, but are also talented musicians and songwriters. With the likes of hit production team GOOOOOOOO!!! Music (Pop & Oak) backing them, they're producing impeccable music. After a few releases in 2013, the guys are starting 2014 off with a bang. It was just announced that they will be opening for the amazingly talented Marsha Ambrosius' Lovers & Friends Tour. Hopefully everyone missing that real male group sound will check them out. They definitely fill the void so many are missing! Be sure to head over to TicketMaster and get your tickets to hear them and Marsha live! Check out the below video of their incredible medley ft. Justin Bieber's Heartbreaker and a host of hit records we all love. Don't take my word for it. Check them out!